Pakistani troops backed by artillery and helicopters attacked hideouts of suspected foreign militants in a remote tribal region near Afghanistan on Friday in continuing clashes that have killed 50 people in the past three days, the military said. The skirmishes started Wednesday when militants fired rockets on army checkpoints near Wana, the main city in Pakistan's South Waziristan tribal region, sparking an exchange of fire between the troops and rebels. "Today, we appropriately responded to the latest unprovoked attacks by the terrorists," army spokesman Maj. Gen. Shaukat Sultan said Friday. The Pakistan army later said in a statement that 35 militants and 15 security forces had been killed in South Waziristan since Wednesday. It said the militants had taken the local population hostage, forcing the army to take action to flush them out. About Friday's assault, it said the army was targeting "known and confirmed hideouts of miscreants." Government and security officials said the army was pounding the hideouts with artillery, mortars and other weapons, while helicopters also were seen flying in the area. Residents in Wana told AP by phone that they saw some fighter planes in the area and heard a "loud explosion," suggesting the military might have dropped bombs on the militants' hideouts, but Sultan refused to confirm any bombardment. "We cannot give such operational details at this stage," he said. Pakistan's tribal areas bordering Afghanistan are considered a possible hideout for Osama bin Laden and his chief aide, Ayman al-Zawahri. There was no immediate indication that top al Qaeda figures were among those involved in the latest fighting. Tension has been building in South Waziristan over the past month as authorities have pressured tribesmen to evict hundreds of Central Asian, Arab and Afghan militants, many of whom moved there from Afghanistan after the fall of the Taliban regime in late 2001. Pakistan forces launched a major crackdown there earlier this year. In a break with prior Pakistani policy that included covert support for the Taliban, President Gen. Pervez Musharraf has targeted militants since aligning himself with Washington after Sept. 11. He has been the target of repeated assassination attempts. The militants have refused to surrender and register with authorities despite a government amnesty offer that would allow them to settle in Pakistan if they renounce terrorism. The army said it would grant an amnesty to any locals it deemed "facilitators" of the foreign fighters if they agreed to surrender. However, it condemned tribal strongmen who had been granted an amnesty in April in return for turning over all foreigners in their midst. 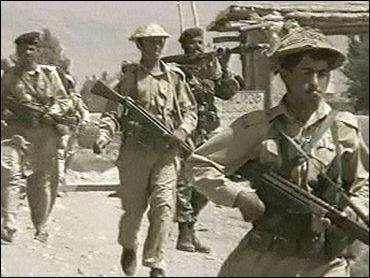 No militants were ever handed over, despite the withdrawal of many Pakistani troops from the combat area. The army statement said the leaders "started taking undue advantage from this amnesty in order to draw personal benefits at the cost of their fellow tribesmen." The foreign militants on Wednesday "betrayed the trust, abused the government's sincere offer" by targeting security forces, it said, adding they "forcibly occupied a civilian compound and used women and children as human shields." Across the border in Afghanistan, insurgents fired rockets at a convoy carrying U.N. and government officials and American military officers in Paktika province, which borders South Waziristan, police said. No injuries were reported. The convoy was carrying Paktika Gov. Ghulab Mangal, U.N. officials and American military officers on a mission meant to lay the foundations for a return of government administrators to the province, which is considered a stronghold of the ousted Taliban regime. The convoy of more than 30 vehicles, escorted by U.S. and Afghan soldiers, was passing through Gomal, a lawless district 140 miles south of the capital, Kabul, provincial police chief Gen. Mohammed Rahim Alikhel said. "Suddenly they were attacked with rocket-propelled grenades fired from a long distance," Alikhel told The Associated Press. "They had a lot of security, and the attackers fled in less than two minutes." Alikhel said 11 rockets were fired at the convoy from a mountainside. Several journalists, including a contingent from ABC News, were accompanying the convoy. It was unclear whether any of the vehicles was hit or if U.S. troops joined Afghan police and military guards in returning fire. Poor security has so far prevented the United Nations from starting to register voters in Paktika and many other regions of the south and east, hampering preparations for national elections slated for September. Meanwhile, two men were arrested Friday over the slaughter of 11 Chinese road workers in northern Afghanistan, the deadliest attack on foreign civilians since the fall of the Taliban. Three more suspects were being sought, Gen. Mohammed Daoud told The Associated Press. The contractors were slain early Thursday when assailants crept up to their tents in a desert camp 150 miles north of Kabul and shot them as they slept. The camp's sole armed guard was also killed. The attack was the worst in a series against relief workers, private contractors and staff preparing for the U.N.-sponsored elections, threatening already slow reconstruction efforts as well as the vote. President Hamid Karzai, speaking to reporters during a trip to the United States, condemned the attack and urged the Chinese reconstruction teams to stay. "I want them to continue to do their work," he said. "I want them to be brave and not lose heart and be with us, and I want them to stay and continue to rebuild Afghanistan." Ordinary Afghans also feared that badly needed rebuilding work will dry up. "They were just innocent workers," said Mohammed Naim, one of about 30 turbaned tribal elders who came to the airport in Kunduz to pay their respects. "We hope the Chinese government doesn't stop the work. Our roads are very bad."